When I reviewed the Studio Electronics Analogue Tone Chameleon (ATC1) in November 1996, I was impressed by the sound of this analogue synth module, and by its switchable filter concept. Back then you were given the option to purchase plug-in cartridges which would change the filter characteristics of the synth. A little later, an external unit capable of MIDI switching between the four available VCFs was made available, and this proved to be a much slicker method than unplugging the rear-mounted filter cartridges. Fast forward to 2003 and an updated ATCX has arrived, boasting a new look and having no need for a plug-in filter system, since all four filters are already present inside the synth. 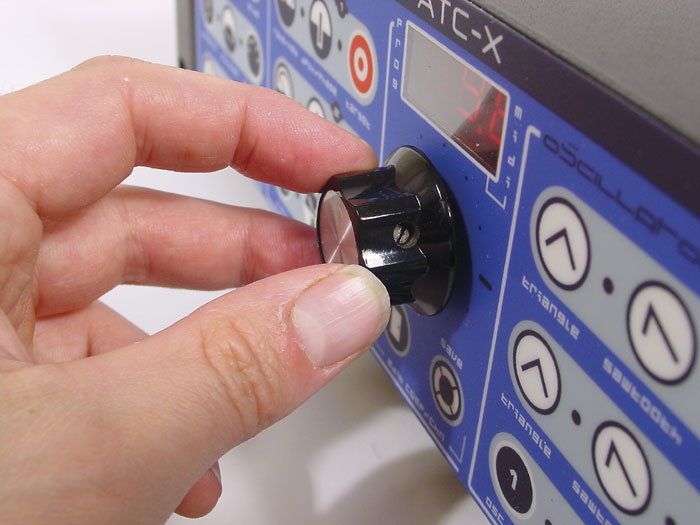 A compact 2U high, and with a single rotary encoder for making edits, the ATCX is best operated with two hands. It's logical enough: you push the appropriate front­panel membrane switch and update the value shown in the inscrutable 3-character display with the encoder. Sometimes you need to push the switch several times to reveal new options. As a real-time controller, the encoder is smooth and responsive but will never supplant a bank of knobs for those of us who like to tweak at speed. There isn't even a main volume control; you must push the red Volume button and the encoder then alters volume. This is less than ideal if you need to quickly silence a wayward drone during a gig! At the back of the synth we find the single audio output and just two MIDI sockets: In and Out. External processing is catered for by the inclusion of an input to the VCF (Voltage Controlled Filter) and a second input to the (new) analogue ring modulator. A dedicated output from the ring modulator is also present, but this is of less value than you might think. (See the 'Externally Yours' box for details.) An on-off switch is located at the rear, above the standard 'kettle' connector for the internal auto-switching power supply. The only omission in this upgraded model is the ATC1's CV/Gate connectors, to which we bid a fond farewell. Let's have a quick recap of the ATC's facilities for those of you who don't hoard your old copies of Sound On Sound (or, instead, you could check the review online at our web site). Essentially, Studio Electronics never stray far from classic architecture — and why should they! Thus the ATCX is a monophonic synthesizer featuring two analogue oscillators, four analogue filters, two software-generated LFOs and three software envelopes. As the unique, switchable filter design is the raison d'etre of the Tone Chameleon, we'll discuss it in some detail later. The oscillators feature triangle, sawtooth and variable square waves, all of which may be active at once. Cross modulation, taking oscillator two as its source, may be directed at oscillator one or the filter, and its level is controllable by LFO or envelope. Oscillator sync is provided, and there's the option to turn off keyboard tracking for the sync'd oscillator. New for this model is an analogue distortion effect, accessed by an extra push of the Noise Level button. This distortion circuit, which generates varying tones according to the filter currently selected, is a superb way to dirty up bass and lead sounds. Even at low levels it imparts a degree of rawness that is tempting to over­use. I mentioned that three envelopes are provided. Envelope one is fixed to control the VCF, envelope two the VCA, and the third envelope is freely assignable to a wide variety of modulating tasks, such as oscillator frequency and level, cross­modulation level, LFO rate and depth, pulse width, resonance and so on. Throughout the ATCX, modulation sources typically have but one destination — you can't assign the free envelope to sweep resonance and cross-modulation level at the same time, for example. This makes things simple to understand, but imposes some restrictions on the degree of wackiness achievable. Two LFOs are responsible for cyclic modulation, with just one of these — LFO 2 — capable of sync'ing to MIDI clock, in divisions ranging from a whole note to a 16th-note triplet. Due to display limitations, there are the usual cryptic abbreviations: LFO waveforms, including triangle, noise, and random, are shown simply by the numbers 1-6. (Fortunately, a Quick Reference guide for all the display abbreviations is provided, although it doesn't take long to memorise them.) Note triggering may either be multi or single, with priorities of last or lowest note available. Only my personal favourite (highest note) is absent — wouldn't you know it? I found the original ATC1 cosmetically similar to the Moog Source with its coloured membrane switches and single-knob operation. The ATCX features a reworked panel, replacing the previous pastels with a look that is predominantly blue. Unfortunately it has gained some of the most ugly, illegible text I have seen on a synth, and the graphics offer no improvement in clarity either. Before I make this into a whinge about style, I should point out that these are opinions based on my personal taste. I think it looks horrible, but you might actually like the graphics — and even the lettering! Having vented my spleen about the ATCX's appearance, it's time for me to have a go at the manual too. It's poorly printed, out of date and confusing. It is, actually, just the old ATC1 manual, exactly as it was, complete with diagrams and panel images that refer to the original, unfussy look. If you're overcome with nostalgia at this point, you should explore the Studio Electronics web site where you'll find another edition of the synth available — in the earlier style. Apparently an 'ATCX addendum' sheet should be supplied with the new synth too, but this is no budget synth and I don't think a full rework of the manual is too much to expect. The audio input allows you to use the ATCX as a stand-alone filter unit, processing external signals through the currently-selected VCF. It lacks any onboard means of setting the level of the external signal, and there's no provision to bypass envelope control of the filter and VCA either. You need to hold down a note before you hear any of your processed signal. That said, the results are very promising, and using external sources is a great way to become familiar with the different filters. The ATC1 doesn't have a ring modulator, so its inclusion on the ATCX opens up welcome areas of metallic, bell-like strangeness and charm. The ring modulator has but a single control — Amount — that shares a button with cross-modulation amount (repeated pushing toggles between them). Normally, the ring mod sources are the two VCOs, but the rear panel features a dedicated ring modulator input for torturing and warping external signals. When a signal is patched into this jack, it defeats the onboard oscillator, so your audio becomes the carrier. As few people will want to fiddle around the back of a rack unit to perform patching, a patchbay will come in handy here. With this in mind, the modulator signal — an oscillator drone — is available as an output too, so you can patch it back in again when not processing external audio. Had the ring modulator's output been available too, it could have been brought into service as on a modular system — ie. audible without needing to supply a gate signal. That small gripe aside, ring modulation of external sources is very effective and makes a welcome bonus. Ring modulation level is available as a modulation target for either of the LFOs, the various MIDI control options (mod wheel or aftertouch, for example) or envelope 3. This Analogue Tone Chameleon's greatest asset is its ability to switch between different hardware filters — no longer by means of cumbersome cartridges or via an external cartridge adaptor. Instead, selection is made by a push of the red 'crosshair' button marked 'Type/Inv' in the filter section. This toggles between filter type and envelope inversion. As on the ATC1, you can invert the filter envelope, the 'free' envelope (envelope three), or both of them. But it's with VCF selection that the real fun starts: a spin of the rotary encoder reveals all four of the original cartridge filters onboard and eager to be selected. The available filter types are Mini, SEM, 303 and 2600, represented in the display as '24d', 'ob', '303' and 'ArP'. They are designed to closely correspond to the filters found on the Moog Minimoog, the Oberheim Synthesizer Expander Module, the Roland TB303 and the ARP 2600. They're well chosen in terms of classic low-pass design, with each having its own distinct character. Much has been written about the Minimoog filter design and I won't repeat it here. All you need to know is that it sounds creamy and wonderful and is everything you'd expect. The SEM's 12dB response stands out most from the others, being bright and more subtle, with a resonance that never dominates (or self-oscillates), even when the filter is set to maximum. When I scanned my original review of the ATC1, it seemed to me that this filter was my least favourite of those on offer, but times and tastes change. Perhaps it's because I've heard everyone-and-his-dog's version of a Moog filter over the years that I value more delicate characteristics now. Hey, I'm an analogue creature too, and hereby reserve my right to variations and inconsistencies! The 303 filter is suitably realistic, and really comes into its own when the analogue distortion circuit is switched in. Because of the versatile architecture of the ATCX, you're not restricted to mere acid basslines with this filter — but it can deliver them with gusto! I could continue talking about the ATC's filters, but describing the differences between low-pass varieties starts to get into 'dancing about architecture' territory. Suffice to say that you won't get bored in a hurry! As I was about to draw a line under this part of the review, I stumbled across a mode selector by an accidental second push of the Keyboard Tracking button. Until then I had believed the choice of filter was limited to low-pass operation only, and that the ATCX lacked the high-pass switch of the original Oberheim filter cartridge. Not so! The 'hidden' mode selector I found allows you to toggle between low-pass and band-pass modes — shown in the display as 'LP' and 'bP' — for the Oberheim filter only. Once again I cursed the manual. I'd have felt pretty stupid had I completed this review but failed to spot the band-pass mode — especially as it's rather sweet! When you select low-pass or band-pass operation in this way, a relay makes a physical clicking noise from deep within the bowels of the ATCX. Studio Electronics, in their typically wacky way, suggested popping a microphone near the synth and using this noise creatively, although this could have been their way of telling me to stop asking dumb questions. I don't often take the gynaecological approach when reviewing synthesizers, but in this case I grabbed a screwdriver and took a curious look inside. This revealed the internal filter system mounted on a single board, the connector that previously interfaced with cartridges having been rerouted internally. It's a far neater solution than the cartridge system — except that it's 'closed'. Without an external connector, there is no provision for Studio Electronics to further extend the tonality of the synth by incorporating a state variable filter, an MS20 filter, a Wasp filter, or whatever, in the future. Auditioning the 512 factory patches requires a considerable investment of time. Even though they're organised into four banks of 128 patches (grouped by filter type), it's a daunting task to try to maintain a clear memory of the highlights as you spin the dial through the numbers. Nevertheless, it's my feeling that Studio Electronics have played to their greatest strengths. Thus the ATCX is packed with thick, warm basses and ripping solo patches, with occasional atonal strangeness thrown in for good measure. This synth sounds fantastic, expensive, fat, American. It's the unashamed by-product of a diet of burgers and fries, with no regard for muesli or tofu. And yet, with tweaking, you can also discover subtle, more 'Japanese' tones, the Oberheim filter being especially useful for brighter, lighter, cholesterol-free solos. However, it was to the range of basses that I turned most often; some of those bottom-heavy subs are just perfection! All the factory sounds can be overwritten — perhaps fortunately, when even the simple action of selecting a different filter type and mucking about with cutoff and resonance yields usable variations that become keepers. The synth doesn't help you keep track of your location within the labyrinth of patches; it always powers up on patch location 1. An extra page slotted into the ATCX's manual details enhancements for version 2.0 ATC software. This software upgrade is available for the ATC1 and incorporated as standard into the ATCX. The improvements include phase control and a retrigger function for the LFOs (their cycle is now restartable when you play a key), plus the ability to control two different modulation destinations from the mod wheel, each with different depths. The mod wheel accomplishes this by hijacking the current pressure (aftertouch) assignment: simply hold down the Pressure button then press 'Exit': aftertouch is then deactivated and re-routed to the mod wheel. As I forgot this combination on one occasion, I inadvertently discovered that the synth will reboot if you hold down the Pressure and Mod Wheel buttons simultaneously. Another improvement is the extension of Glide to include a 'legato' mode, and it may be selectively disabled for VCO1, VCO2 or the VCF. Otherwise glide is sent equally to all three of these sources. Finally, MIDI controller numbers have been implemented for functions such as filter selection, LFO wave selection, oscillator 2 mode and so on. The MIDI spec of the ATCX is therefore as comprehensive as it should have been in the first place, and tweaks can be recorded via the MIDI output into your sequencer. Owners of the original ATC1 can install the enhanced software, but the upgrade is chargeable and costs $24.95. The latest OS version is 2.2, according to the Studio Electronics website. For many of us, the joy derived from analogue synthesizers is, in part, due to the hands-on control they so often provide. The ATCX's membrane panel, single knob and enigmatic display are a bit of a turn-off in that respect. Nevertheless, this is a superb­sounding bit of kit, crammed full of fat, ripping, squealing mayhem. 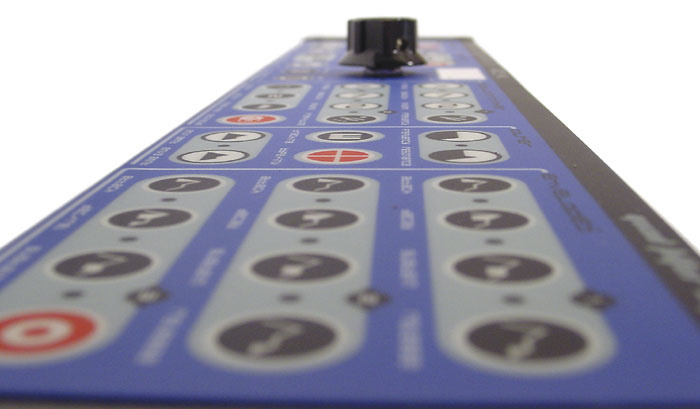 If knobs are essential to you, a MIDI Control surface would be the ATCX's ideal mate. The four onboard filters each bestow their own character and are, without doubt, the synth's main selling point. It almost adds up to four different instruments to learn, each with their respective tonal and resonant responses. Other new additions, such as the distortion and ring modulator, sound great, and with the external processing options it all adds up to a well­rounded package. Yet I can't help wondering if this synth has missed its window of opportunity. Expectations rise over time, and the ATCX is quite expensive, even taking into account the included filters. There are now knobby monophonic synths on the market costing not much more but offering a far better user interface, and you'd need to be pretty convinced about the elaborate filter design before parting with your dosh. After all, for another £150 you could buy Studio Electronics' own SE1X, with its Moog/Oberheim filters, knobs and display, three oscillators per voice, and so on. In the end, it boils down to sound and versatility. The chameleon nature of this synth allows it to offer a very broad palette of tonal choices within a single monosynth, and this could be the reason for choosing an ATCX over the competition. User interface feels like a cost compromise. But couldn't it be cheaper? Manual refers to older model. The ATCX sounds great and is straightforward, if a little long-winded, to use. You can generate a diverse spectrum of quality solos, basses and sound effects with it, and the filter selection system offers variations worthy of the Moog, Oberheim, ARP and TB303 filters being mimicked. It is a little expensive, given the compromises in the user interface, but has that unmistakably classy American sound that many strive for but few capture. ATCX as reviewed, with four filters, £1249.99; model with 'Mini' (Minimoog) filter only, £1099.99. Prices include VAT.